Ian Clarke’s second album doesn’t disappoint. Each of these works was written by Clarke between the years 2006 and 2012, and this album proves that he continues to write music that is fresh, inventive, and accessible. While they rely heavily on extended techniques, these techniques come across as organic to the piece and don’t make a spectacle of themselves. Instead, they enhance the unique language of Ian Clarke’s compositional style and are evocative of the natural world. 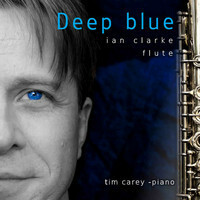 Deep Blue (flute and piano) is the newest work in this collection. It includes some really lush sounds in the flute’s low register; the melody climbs higher as it intensifies. This piece is partly inspired by the ocean and whale song. The curves featured in Curves (three flutes and piano) manifest themselves through the use of quartertones. Texture is also an important feature here and is brought out through alternate fingerings that work alongside the standard fingerings. The third movement brings back themes from the first two movements. This work was recently named one of the winners of the 2013 National Flute Association Newly Published Music Competition for small flute ensemble. Hatching Aliens (flute and piano) employs extended techniques to establish an alien landscape. Connecting back to the idea that this album explores links with the natural world, this “alien” landscape could truly be otherworldly, or it might be a way to look our world in a new way. Beverley (solo flute), is a song for flute written in 2011. It requires the use of alternate fingerings to create interesting changes in timbre. It dispels the energy of the album well, and provides a solid bookend to the first piece on this album, Deep Blue. Incidentally, the sheet music for these two works is published together. -Originally published in The Flute View magazine, July 2013. Subscribe here!